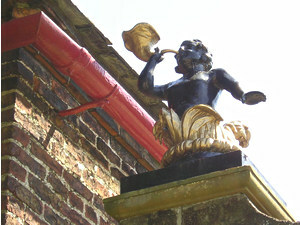 This Triton, blowing on his conch shell, is on the gatepost to the church in Sledmere. 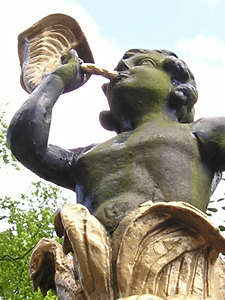 He’s one of many fascinating sculptural elements in this much-admired estate village. There are so many things to see in Sledmere that I’ve had to include several pages on the various memorials – see the links at the bottom of the page. This page has photos from the village, and the deer park, which is open to the public via a permissive path. 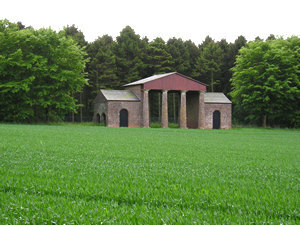 Having visited Sledmere’s village, and admired the delights of its surroundings, I have a high regard for its handsomeness, and a much higher opinion of rich landowners (previously not fondly thought of, because of the large chip on my working-class shoulders). This section of road, with its extremely handsome well/memorial has been pictured far more impressively in David Hockney’s painting ‘The Road to York through Sledmere’. I’ve included another page on the monument to Sir Christopher Sykes. A wander along the road through the village reveals many architectural details those who are driving through might not notice. 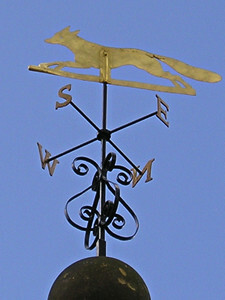 Left – from the top of the well/monument mentioned above. 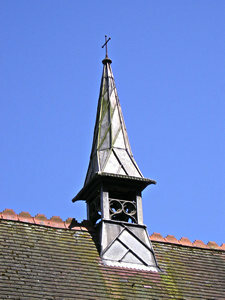 Right, a spirelet on the roof of the school. 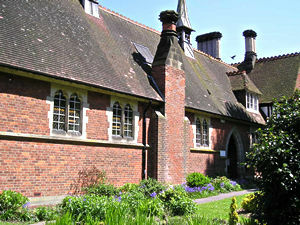 The school, above left, dates from 1874-5, and was designed by G E Street, with a later addition by Temple Moore. 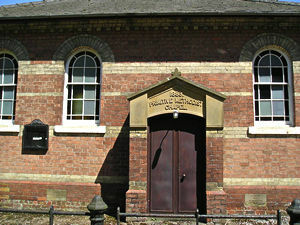 Much plainer – but still handsome – is the Methodist chapel, dating from 1889, by William Petch. 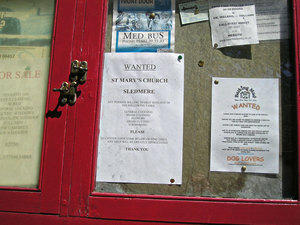 There’s a satisfying neatness and order in Sledmere – it’s a very well-kept place. One of the things I noticed was the paint colour. 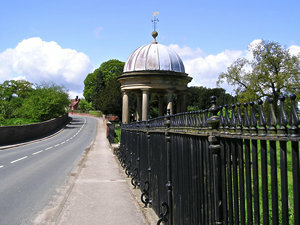 The Triton on the photo above left is at the entrance to Sledmere House, but the red guttering behind him is repeated on the guttering of the less substantial houses on the other side of the street, and on the village noticeboard. 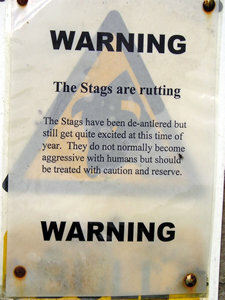 The Stags have been de-antlered but still get quite excited at this time of year." [don’t we all – it’s May, it’s all green and everything!] "They do not normally become aggressive with humans but should be treated with caution and reserve." And here we are. Oh deer, oh deer, oh deer, oh deer. Lovely, aren’t they. Though we did notice that one at least hadn’t been de-antlered, and we kept our distance. They were reacting to our presence with caution and reserve, and we reacted similarly, respecting their dearness/deerness. As we walked across the park, the number of deer became apparent, as did the fact that every single one of the assembled throng was apparently checking us out, as friend or foe. It’s quite a spectacle, so many deer eyes looking at you, and so many deer ears all upright and pointing in the same direction. Unfortunately I don’t think this photo fully conveys their dear ears and dear eyes, as I was at some distance, not wanting to frighten them. And I almost forgot to mention, having been distracted by the huge deer gathering, that earlier during our wander through the park, we had a marvellous view of Sledmere House itself. 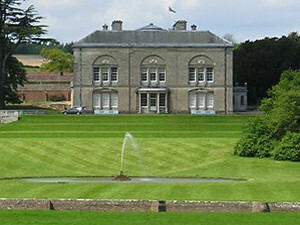 The present house was begun in 1751 by Richard Sykes, later extended in the 1790s by Sir Christopher Sykes. It is open to the public for part of the year – for details see the Sledmere House website. 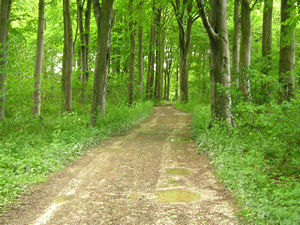 The path curves round back towards the road, and for a time runs parallel to it, along a beautiful tree-lined track. 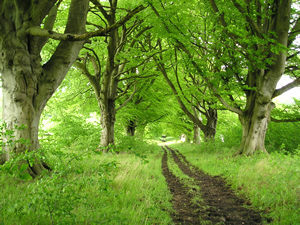 Walking along this track, in late May, with the trees in their green perfection, is one of my favourite memories of Sledmere. Those past landowners who planted the trees wouldn’t have been around to see them fully grown. But their descendants, and, happily, the rest of us too, can now walk among them. 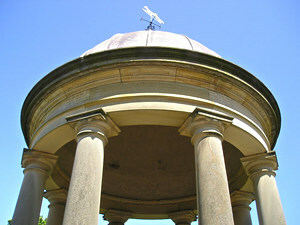 There are several handsome and fascinating monuments, including the well memorial mentioned above. I’ve covered these elements on separate pages. See: more about the Sykes well memorial, the Waggoners memorial, and the Eleanor Cross. In the grounds we walked through there is also a monument to the Sykes family’s dogs. Though charges are payable to visit Sledmere House itself, there is a permissive path allowing public access through the grounds, including the deer park. Note that high stiles at the edges of the deer park may make access difficult for some visitors. The route, and many others of interest, is included in a lovely little book in the Jarrold Short Walks series: In and Around the Vale of York: Leisure Walks for All Ages.